Back around Aug. 21, I previewed the NFL MVP race for this season. And now that the league is at its quarter-pole (all teams but Pittsburgh and Indianapolis have played at least four games), let’s look at Bovada’s re-posted odds for that award. Indeed, Green Bay is 2-2 (well, really 3-1) and the offense that led the league in scoring a year ago is simply average so far. The Packers are No. 20 in yards per game (333.5) and 19th in scoring (21.3). As usual, the Packers can’t run the ball, but that’s no surprise. Rodgers ranks 12th in the league in rating (set an NFL record last year) and 15th in yards per game. He has been sacked 16 times, the second-most in the NFL. By the way, Bovada also has a special on that: Will Rodgers be the most-sacked quarterback in the regular season, with “no” at -400 and “yes” at +250. I love yes there because of how much he will throw – Arizona’s Kevin Kolb has been sacked 22 times but has played one more game and likely won’t be starting all season. Now Rodgers is the 5/1 co-second favorite to win MVP with Tom Brady (was 13/2). The Pats’ star has “only” seven touchdown passes through four games and is sixth in rating. I don’t like him on this prop as the New England offense doesn’t appear to be humming like normal. Plus, the Pats are actually running the ball these days. I also don’t expect another 12-win season in New England. The biggest dropper on the MVP props has been Drew Brees. He was 9/1 in the preseason and is now 20/1. Forget about Brees winning this award with the Saints at 0-4 – the MVP doesn’t go to a player on a losing team in the NFL. I was a fan of Jay Cutler at 30/1 back in the preseason, and he’s now 15/1. Cutler has been typical Cutler so far: two great games, two lousy games. If he plays every week like he did in Monday night’s win over Dallas, the Bears could go 12-4 and Cutler may well win this award. But he’s just too inconsistent. 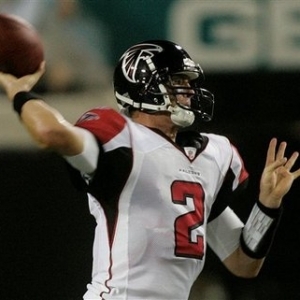 Atlanta’s Matt Ryan is the new favorite at 9/2. It’s hard to argue with that as the Falcons are unbeaten and Ryan is the NFL’s top-rated quarterback at 112.1. Ryan has had a rating of at least 100 in every game and is now 27-0 all-time with a triple-digit rating. But the Falcons haven’t shown much heart when it matters in years past and I’m not buying quite yet. I might roll the dice now on Joe Flacco (20/1), who is third in the NFL in averaging 317.0 yards per game and has as many touchdown passes as Brady, Eli Manning, Matt Schaub and Rodgers. The Ravens are now an offensive club, ranking No. 2 in total offense and No. 5 in scoring. Baltimore might be the best team in the AFC and could finish as the No. 1 seed in the conference. OK, I know Houston is 4-0 and looks dominant. But the Texans are very dependent on the run, so I don’t think Schaub (20/1) puts up big enough numbers to win MVP. If the Ravens win at Houston in Week 7 and enter their bye at 6-1, Flacco might be the MVP favorite if he performs well in the next three games (at KC this week, then vs. Dallas before Houston). I haven’t done too well yet on the NFL’s highest-scoring team each week. In Week 4, I liked the Lions as the best value at +1200 on Sportsbook.ag as they were home vs. the Vikings. Last year, Detroit was a mini-New Orleans when the Lions were at home. But, clearly, something is wrong in Motown as the Lions managed just 13 points in a loss. I am off them for good. New England won the week with 52 points vs. Buffalo despite having seven at halftime. The Patriots are the +450 favorites this week against Denver as Brady faces Peyton Manning for the 13th time (see my Week 5 player props specials story on our homepage). But I like the Saints at +500 vs. San Diego in the Sunday night game. I think Brees is jacked up that Sean Payton will be in the building to watch his QB set the consecutive games with a TD pass record, and that it will be a shootout (highest total on the board at 53). I might have taken the Packers as better value at +700 at Indianapolis. But now look for the Colts to play inspired football for head coach Chuck Pagano, who was diagnosed with a treatable form of leukemia earlier this week and likely won’t be back on the sideline this year. For the top passer this week, go with San Diego’s Philip Rivers at +1000. I’m guessing the Bolts fall behind early in New Orleans and Rivers puts up a ton of yards against a lousy defense. On the most rushing yards, I like San Francisco’s Frank Gore at +600 against Buffalo’s No. 28 rush defense. And on the receiving yards, take semi-long shot Jordy Nelson of Green Bay at +1000 at the Colts. With Greg Jennings out, Nelson should be Rodgers’ top wideout target.